The title was made from a shiny silver material, how could I resist? While browsing the bookstore the other day, the beautiful cover of this book caught my eye. 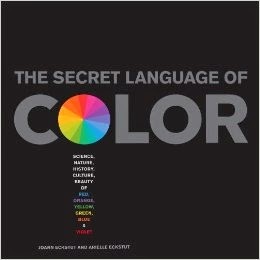 I just had to take a look at "The Secret Language of Color" by Joann and Arielle Eckstut. It's an interesting combination of history, science, culture, and other tidbits relating to color. Often books of this nature are organized by time period, historical event, scientific theory, or region, but instead, this one is separated into sections by color. Of course, I had to flip through the pages of my favorite color: yellow. There was information about everything from the feelings people around the world associate with the color (both positive and negative) to the story of the Yellow Emperor. It was also filled with random facts- did you know that the first taxis in the U.S. were red before they switched to their signature yellow color? This would make a lovely addition to a coffee table, especially since the subject matter means that each page is vibrant and brightly-colored with photos, artwork, and graphs. Any recommendations for other good coffee table books?